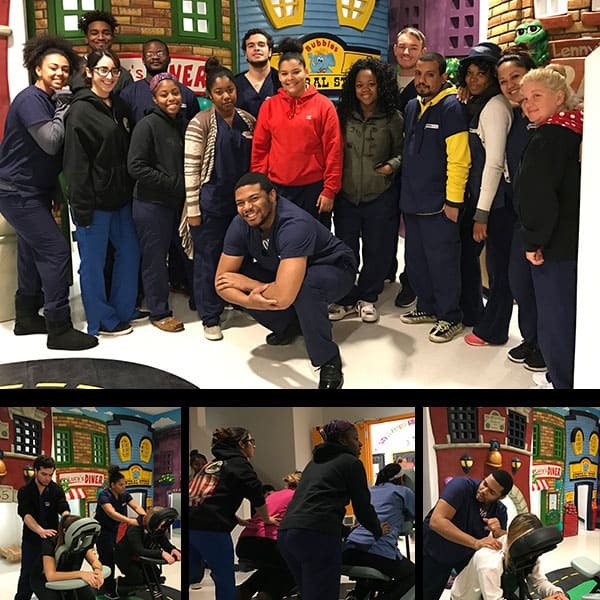 The students also handed out business cards and circulated a sign-in sheet so the day care staff could make follow-up appointments at the American Institute student massage clinic. “It’s important for our students to see that people in many different occupations need massages,” said Ms. Weinerman. “They feel so great knowing they helped so many people, and that everyone they massaged absolutely loved it. It gives the students a lot of confidence.” The students did such a fantastic job, in fact, that the day care manager asked if they could come back regularly. Ms. Weinerman is planning to organize monthly visits next year. “I’m proud of our team and our students for their commitment to make a difference in our community by providing service wherever and whenever they can. It’s an important part of what makes American Institute such a great place to be, and I’m delighted to see it in action,” noted Campus President Timothy M. Rodgers.